It’s P52 time again! This week’s theme was Negative Space. I love photographs that incorporate negative space, which is essentially the opposite of filling the frame. When you incorporate negative space into an image, you often leave a large area of the frame empty. That isn’t always the case, as you could fill the frame with a field of red flowers punctuated by a single white flower, & the image becomes about the white flower, using the red flowers as negative space. While negative space is one of my favorite techniques to use in my work, to be honest, I was feeling pretty uninspired this week. I had put off the assignment until the very. last. day, & was determined not to miss a week, when I looked down and noticed the pattern the milk in my coffee had made on the surface. I decided that was as good as it was going to get this week, dragged a chair over by the window so I could get up high enough to get the perspective I wanted, and shot this. I’m still not sure how I feel about it. I like it because this is my view every morning as I’m trying to drag myself up out of the depths of sleep & get motivated to start school (have I mentioned I’m not a morning person? ), and therefore it is a little slice of my life right now, in this moment. But beyond that, I’m not sure. Maybe this week I will snap out of the blahs that have had me in their grip & feel some serious inspiration! Next on the blog circle this week is Justyna – hop on over & see her interpretation of the Negative Space theme. Love seeing your blog! Been liking your photos for a while on Instagram…feels like I know you!! 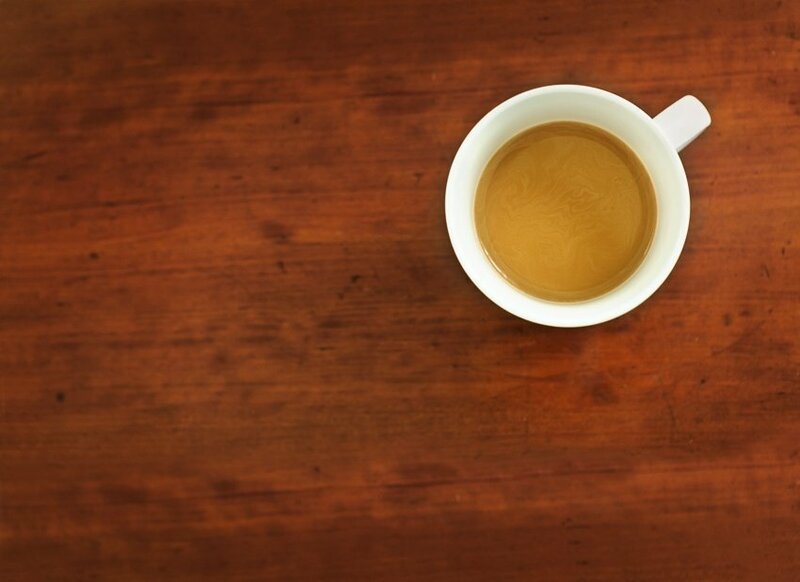 Love this photo especially…the negative space/composition is perfect and coffee is always a welcomed sight!! Thank you so much, Bethann! I love your IG too – the views you post from your back yard are amazing! And I totally agree – it doesn’t get better than a warm cup of coffee. I get where you are coming from. But I also feel like this blog circle is definitely helping with the motivation. Oh absolutely! This blog circle is keeping me shooting through the unmotivated days, when I would normally not even pick up my camera.